A common question I've received over the years is “how to I get a blurry background in my photos?”. The answer sounds more complicated than it is, when you put it into practice. The area of focus (i.e. the depth of field). The distance between the subject and it's background. The area of focus is the distance in front of and behind the subject that will appear sharp in the photo. It is determined by the combination of Aperture, Focal Length, and Distance To Subject. 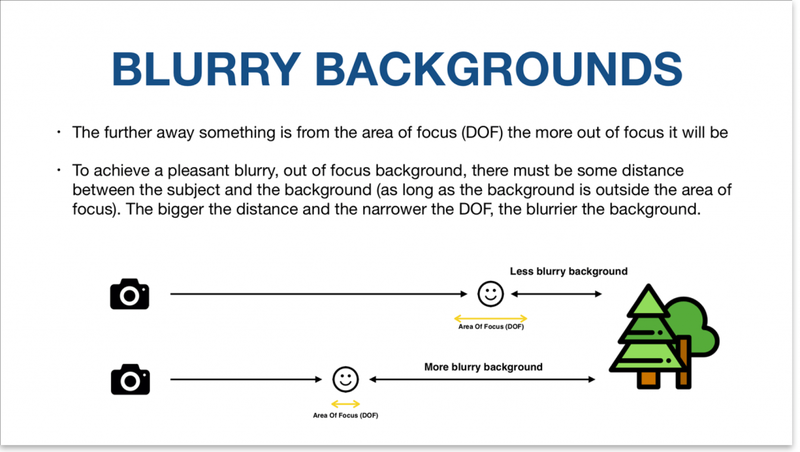 So to make the background blurry, you just have to make sure it's outside the area of focus. Then, the amount of blurriness is determined by just how far the background is behind the subject. This screenshot is from a course I creatively named “How To Get More Shots In Focus”. The course covers this all in much more detail, along with examples and scenarios, lessons on focus modes, focus points, focus stacking, and more. The only place the it is available is inside my Photo Mastery Club membership. Click here to become a member now.